*Note: For a gluten-free sauce, instead of all-purpose, either use a gluten-free flour or use 1 1/2 tablespoons of flax meal. **Note: For this recipe we used this Chili Powder recipe, which has good flavor and is not too spicy. 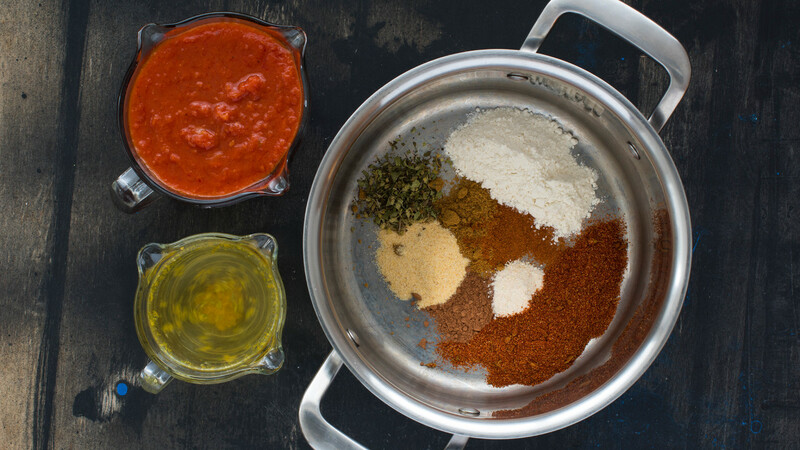 If another chili powder is used, the amount of chili powder and/or cayenne may need to adjusted to suit your tastes. That being said, this sauce is meant to be a bit spicy — but if you are very sensitive to spice, you may want to use less cayenne. Note however that the sauce is meant to be used as a light coating, so it won’t be as hot when used alongside other foods. ***Note: Mexican oregano does taste different than Greek oregano and if possible it should be used for this recipe. 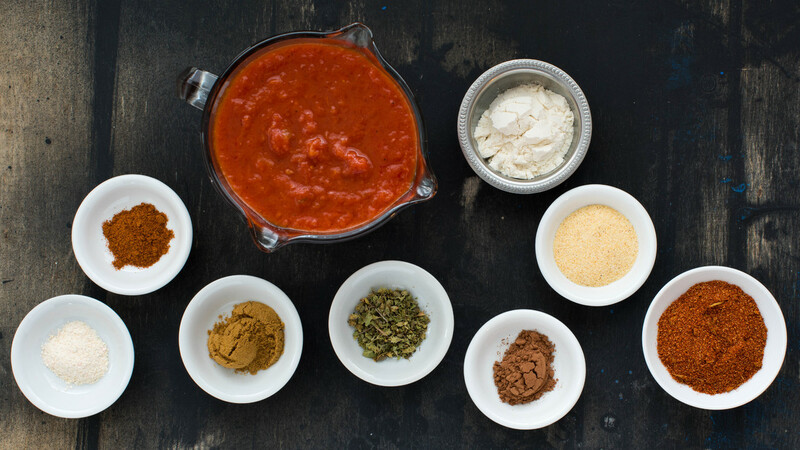 For the tomato sauce, use your favorite neutral flavored tomato sauce, or use this Tomato Sauce recipe. If desired, omit the oil for an oil-free sauce. To cook the sauce, in a saucepan, whisk together the flour (or flax meal), cocoa powder and spices — then add 1/4 cup of stock. Place the pot over low heat and slowly whisk in the remaining stock. *Note: If your stock is quite strong and/or salty, use 2 cups stock and 1 cup water instead of 3 cups stock. Next, add the tomato sauce and bring the mixture to a gentle boil. Let cook for a few minutes until the sauce thickens slightly. When done, it will look like a thin tomato soup. Once done, remove from the heat and taste for seasoning. The amount of seasoning needed, will depend on the saltiness of your stock and also what you are going to use the sauce for. If the tomato sauce used was a bit chunky, you may want to put the sauce into a blender and pulse a few times to create a smoother consistency. This sauce goes particularly well with any type of enchilada — here is a recipe for some delicious Mushroom & Bean Enchiladas. This sauce also goes well with many other Mexican-inspired meals. For a sauce that is a bit sweeter, we sometimes add 1/2 a diced apple to the sauce before blending it. If desired, add a few chilies for extra flavor and depth. We often like to add a few dried Ancho, Guajillo and/or chilies de Arbol. 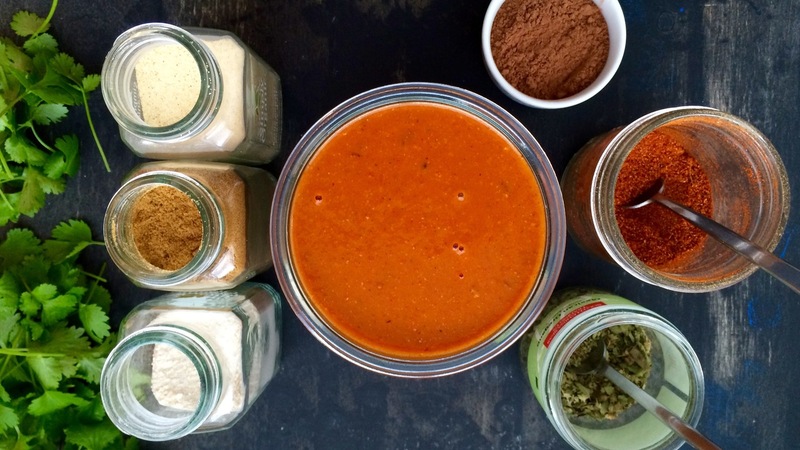 This enchilada sauce was amazing! I made it with the Rouxbe Chili Powder and Tomato sauce recipes which I would recommend. It was great with the Mushroom Bean Enchilada's but equally good over beans and rice for a quick lunch. Can I freeze this sauce? My home is now just my husband and I since our children flew the coup. Yes, Penny, you can freeze this sauce! Made this sauce and it was amazing but I used roasted chicken stock as the base and It was a hit with the vegetable enchiladas! Had extra for chilaquiles the next day. I also used the chili powder mix from the recipe! Please login or join the Rouxbe community to leave a comment.